The Korea Federation for Environmental Movements (KFEM)/Friends of Earth Korea, Seoul Broadcasting System (SBS) and Ministry of Environment of the Republic of Korea present the forth ‘SBS Eco Water Awards’ in November 2011 to those who have worked to protect water environments in Korea and the world. 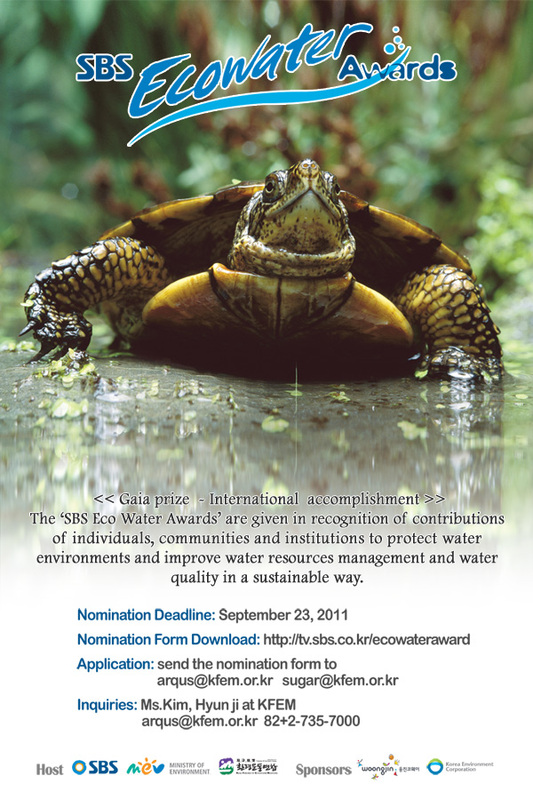 The ‘SBS Eco Water Awards’ are given in recognition for contributions of individuals, communities and institutions to protect water environments and to improve water resources management and water quality in a sustainable way. The awards hope to honor those who work to find sustainable solutions to diverse challenges that arise in water resources management and water related ecosystem conservation. Though water is essential for the survival of many forms of life, water shortage and contamination due to rapid population and economic growth, industrialization and urbanization are posing big threats to human and other life forms on the Earth. We think it is our own responsibility to restore the availability of clean and safe water and healthy environment for the future generations. There are five sections in the awards which are citizens' actions, society and culture, research and education, policy and environmental business administration, and international accomplishments. The Gaia Prize for the international accomplishments section will be given to an individual or institution working outside of South Korea. Award winners will be chosen by the award committee, and a TV crew from the SBS accompanied by some youth award recipients will visit the winner of the Gaia Prize in October to produce a short TV documentary about the achievements of the winner. The awards ceremony will be held in Seoul, South Korea in November 2011. The winner of the Gaia Prize will be given a monetary prize of 20,000 US dollars as well as a certificate. A confederation of 49 local chapters and 5 affiliated organizations, KFEM is one of the oldest and largest environmental NGOs in South Korea. KFEM has actively taken part in the fields of water resources management, river and wetland protection in the country. SBS, which was established in 1990, is one of the largest broadcasting companies in South Korea. It is comprised of one national TV channel and three radio channels. For the past ten years, SBS has produced public interest TV programs such as 'Water is Life' which have contributed to raise public awareness on water related environmental issues. The ‘SBS Eco Water Award’ was established in 2008 and the first winner of the Gaia Prize in the year was the Revive Ariake Sea! Lawyers' Association in Japan whose efforts have focused on the protection and restoration of tidal flats of Isahaya Bay, an important coastal wetland in Kyushu, Japan from a reclamation project. The Onon-Ulz River Movement of Mongolia won the Gaia Prize in 2009. They nullified the mining licenses of two mining companies near the Onon-Ulz River and conducted a restoration project on the surrounding polluted land. Ms. Yin Yuzhen from China won the Gaia Prize in 2010. She has planted trees in desert in northern China and turned it into arable land where she can practice sustainable agriculture and gardening for the local community. The World Wetland Network (WWN), established at the Tenth Conference of Contracting Parties (COP10) to the Ramsar Convention in Changwon, is a rapidly growing independent network of over 300 wetland Non-Government Organisations (NGOs), wetland experts and community groups from across the world. The WWN is extremely disappointed to learn that the Convention on Biological Diversity (CBD) has presented President Lee Myung-bak of the Republic of Korea (ROK) with an award for his contributions to biodiversity. Although we are aware of the ROK’'s ‘'green growth agenda’', interest in green technology, and high profile support of international environmental conventions, we remain convinced that present policies in the ROK are in fact leading to an increase in the rate of biodiversity loss. This understanding is based on detailed information provided both by local WWN partners in-country, and by other wellrespected domestic and international visiting experts. This award clearly sends the wrong message and undermines the new Strategic Plan that the Parties will ratify at the forthcoming CBD COP10 in Nagoya, Aichi, Japan. We believe that the outcome of presenting this award will prove negative for biodiversity in a number of ways. Firstly, the international wetland and biodiversity conservation community is well aware of several highly destructive mega-projects being undertaken in the ROK at this time, and this award will therefore result in a loss of credibility of the CBD. Secondly, this award undermines the good work being carried out by local stakeholders, NGOs and academics in the ROK who have been trying to prevent the negative impacts of projects such as the current Four Rivers construction project, the ongoing Saemangeum and Song-do tidal-flat reclamations and the proposed tidal power-plants. Attempts to discuss and advise on these projects in a meaningful way with decisionmakers is already extremely challenging due to the lack of formal mechanisms to enable open and regular discussions. These efforts will be made much more difficult by this award as it will undoubtedly be used to attempt to further sway public opinion by showing that the Four Rivers construction project and other environmental policies are being lauded by the CBD. Finally, presentation of this award both rewards and endorses the ROK and all other nations who continue to opt for the unsustainable use of hard engineering projects at the expense of natural eco-systems, contra the expert guidance provided by e.g. CBD and the Ramsar Convention. To further explain our collective deep concern, we provide more details below of three projects that are leading to massive habitat change and species loss, but which nonetheless are being presented as sustainable (‘'green growth’') development by decisionmakers in the ROK. 1. The Four Rivers project in the ROK has been presented as a ‘'restoration’' project, but it instead consists of much additional hard engineering, including dredging, culverting and further damming of rivers, leading to considerable loss of biodiversity in the rivers and adjacent wetlands. The ROK’'s own Fourth National Report to CBD highlights concerns about threats to biodiversity from hard-engineering projects of the very same kind: “. . . the endemic ecosystems of the rivers are now being greatly disturbed due to various physical, chemical and biological factors. Physical factors include dam construction, the artificial straightening of streams, dredging, aggregate collection, banking, the construction of submerged weirs and dammed pools”" (ROK Fourth National Report to CBD 2009). With this Four Rivers project costing the equivalent of at least $US 19 Billion, affecting several hundreds of kilometres of river (including Important Bird Areas and a Ramsar site) and many local communities, a high-level of prolonged and open public and stakeholder consultation should have been carried out, and a rigorous and comprehensive environmental impact assessment should have been conducted, before any construction work was started. This would have been in line with the guidance and the spirit of international conventions such as CBD and Ramsar. However, there was very little consultation, the EIA was completely inadequate and conducted in only four months. Even now, data from ongoing monitoring work is not publicly available, and there is no effective process through which concerns for biodiversity can be addressed by those outside of the development bodies. 2. A 33-km long seawall was completed at Saemangeum in 2006, leading to the ongoing loss of 30,000 ha of intertidal wetland and 10,000 ha of sea shallows. 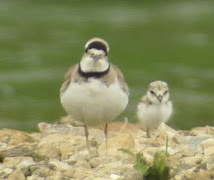 The Saemangeum Shorebird Monitoring Program (SSMP) conducted by the Australasian Wader Studies Group and Birds Korea demonstrated the transhemispheric impacts on migratory shorebirds of this reclamation project, leading e.g. to a 20% or more decline in the global population of Great Knot Calidris tenuirostris, resulting in its listing by BirdLife International (on behalf of the IUCN) as globally vulnerable. While much of the Saemangeum estuarine ecosystem could still be restored, the development ministries continue to promote the conversion of this globally important wetland into dry land as “"green”". 3. Already, probably 70% or more of all historic inter-tidal wetland in the ROK has been reclaimed. Even after the formal commitment undertaken by the ROK government in 2008 that “"intertidal mudflats should be preserved and that no large-scale reclamation projects are now being approved in the Republic of Korea”" (Ramsar Resolution X.22) more tidal reclamation projects and tidal power plants (which will lead to a degradation of remaining intertidal wetlands) have either been approved or are in the pipeline. Further large-scale reclamation at Song-do (Incheon) for example was approved in March 2009 which will result in the further loss of habitat used by at least 11 species of waterbird in Ramsar defined internationally important concentrations, including breeding globally endangered Black-faced Spoonbills Platalea minor. All of the above information is in the public domain, and has been published either in NGO reports, in scientific journals or in the conservation literature. We are extremely disappointed that CBD failed either to consider this information or apparently to consult with independent observers and organizations before presenting such an award, not only in the International Year of Biodiversity, but in the run-up both to the CBD COP10 and the G20 meeting which will be held in the ROK in November. We therefore urge the CBD to reconsider this award, in order to maintain the convention’'s good name. We also urge the convention to improve ways in which they can support the ROK in moves to cancel or at least scale-back the most destructive projects. Both are necessary in order to deliver genuinely positive outcomes for biodiversity in line with the Articles of the Convention on Biological Diversity. Cc: UNEP (Mr Achim Steiner); CMS (Ms Elisabeth Maruma Mrema); Ramsar Secretariat (Mr Anada Tiéga); IUCN; BirdLife International; Wetlands International; WWF.